Live Dragon Tiger (Evolution Gaming) – Fast & Exciting Version of Baccarat! Live Dragon Tiger is a new version of the popular table game Baccarat. The game itself is very simple, but still incredibly fun. The games are also very fast, one round only lasts for around 25 seconds, so there’s almost no downtime. Dragon Tiger is played in a studio with a Chinese theme and the light effects are perfectly synchronized to the game’s results which adds to the excitement. Just like in normal Baccarat, you have side bets and strategies adding multiple layers of excitement to the game. This makes it perfect for both new- and experienced players. Dragon Tiger is perfectly described as a two-card version of Baccarat, and Dragon Tiger has become incredibly popular recently, especially in Asia. It’s been spreading fast to other parts of the world. Evolution Gaming has finally picked it up a while ago and introduced it to a whole new audience, the Live Casino community. So far, it’s gotten nothing but positive feedback and everyone seems to enjoy the fast-paced gameplay. Only two cards are played each round, the dragon and the tiger, and the players bet on which card they think will be the highest, or if it ends in a draw. The player menu consists of many different bet options and side bets to choose between, so even though the game seems simple, there’s a lot of depth once you get into it. Betting on the bank or the player’s hand pays out a normal 2:1, while tie pays out 11:1 as well as half your bet on dragon or tiger if you placed there as well. One side bet that you can bet on is the Suited Tie Bet, which means that you need to not only hit the tie, but they have to be of the same suit. An example of this would be two six of hearts. This is possible since Live Dragon Tiger is played with 8 decks of cards. Live Dragon Tiger has already been released and can be played on most casinos that offer Evolution Gaming. You find many of these casinos over in our Live Casino section here at FreeMySpins. 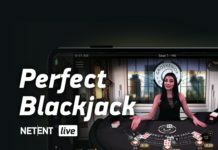 NetEnt Releases Live Perfect Blackjack – Take your gambling to the next level! Cazino Cosmos (Yggdrasil) – Sequel to Cazino Zeppelin! New players at Leo Vegas receive a 100% Bonus at their first deposition, up to 400$/€. Play many different Slots and Live Casino Games at Leo Vegas, a trustworthy and trendy Casino! Another Jackpot Win on Mega Fortune Dreams – 4.5 Million Euro!